VA Form 10-2850b is a United States Department of Veterans Affairs form also known as the "Application For Residents". The latest fillable PDF version of the VA 10-2850b was issued on June 1, 2006 and can be downloaded down below or found on the Veterans Affairs Forms website. NOTE: Complete item 12A, 12B, 12C, or 12D, ONLY if you are not a U.S. Citizen. citizenship. Board certification has been verified (if appropriate). CLERKSHIPS TAKEN IN THE U.S. 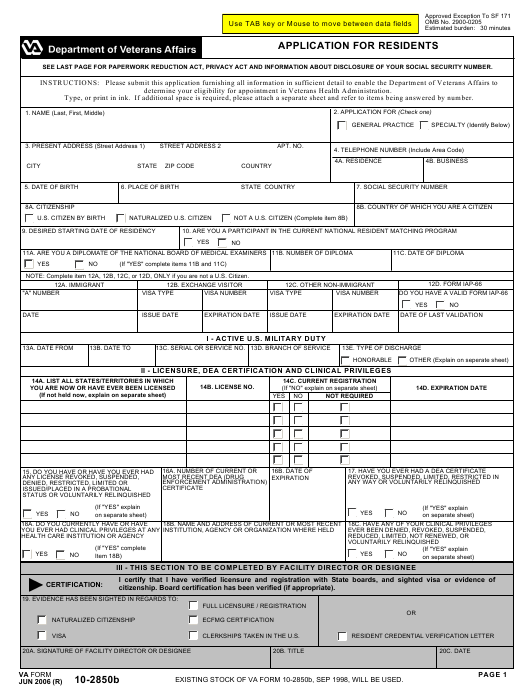 EXISTING STOCK OF VA FORM 10-2850b, SEP 1998, WILL BE USED. (name and address), inclusive dates of service, program type, and program contact for each clerkship. NOTE: For items 25 through 28, specify when service was as a paid Federal employee, including the VA, the U.S. Military, and the Public Health Service. military, Federal civilian, or District of Columbia service? Corrections Act or similar State authority. now under charges for any offense against the law not included in 39 above? may be punished by fine or imprisonment (U.S. Code, Title 18, Section 1001). ARE TRUE, CORRECT, COMPLETE, AND MADE IN GOOD FAITH. VA to make such inquiries. 30 minutes. This includes the time it will take to read instructions, gather the necessary facts and fill out the form. United States Code, Chapters 73 and 74.
verified through a computer matching program at any time. VA personnel policies and thus may prevent you from obtaining employment, employees benefits, or other entitlements. in connection with lawful requests for information about you from your former employers, educational institutions, and financial or other organizations. employees and applicants who have identical names and birth dates, and whose identities can only be distinguished by the SSN.